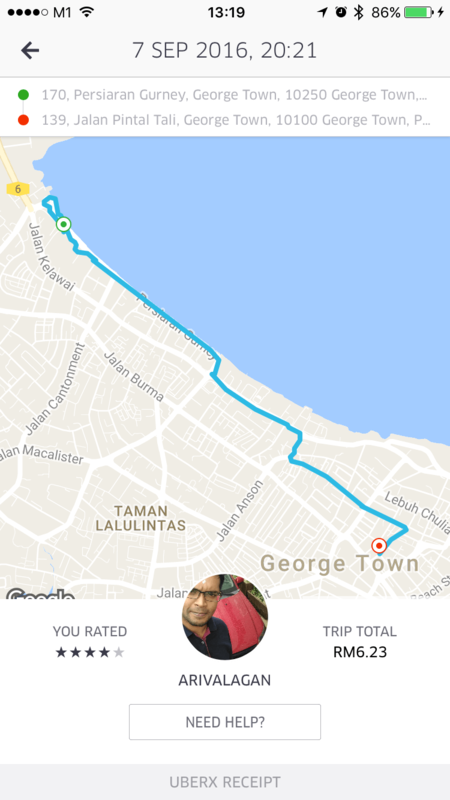 While Uber has already operated for so long, it is only now that I tried using the UberX service in Penang. In Singapore, we still typically depend on cab, but in Malaysia, where cabs do not go by meters and fares have to be negotiated, Uber becomes the obvious choice for clarity and certainty. I was in George Town and the plan for the day was to travel to Penang Hill. The UberX car arrived within mins after the request. My first car was a BMW although it says Proton on his profile. My driver, Choo told me his registered car was under maintenance so he’s using this car for the day. First timer luck! Along the way we had a good chat. 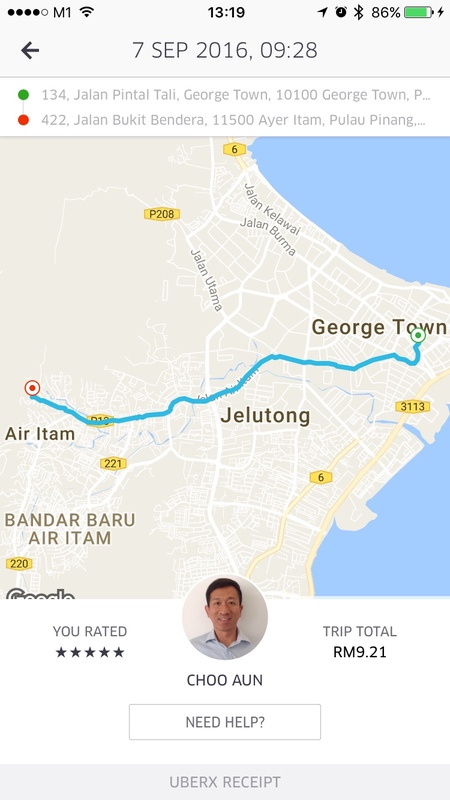 The whole journey was about 20 mins and the cost was RM 9.21. My next journey was to Gurney Plaza from my hotel again. Daniel was my 2nd driver. He’s a friendly chap. Along the way, he introduced to me the different pastry shops and told me which is the better one to go (He recommended Him Heang). We also talked about how he’s doing this Uber thing and how it compares against Grab from the driver’s point of view. Again about 15 mins ride, RM 8.33. Oh, his car was a Kia Cerato Forte. Comfortable and spacious. We got Uber again when we were done with Gurney. I was mildly disappointed when I saw that it was a Proton Saga. But nevertheless, I went with it. Uneventful ride, though the Proton was a bit small compared to the cars I took on the previous 2 rides. But overall it was still ok. My driver, Arivalagan, was not so chatty as the previous drivers, but he’s still polite and attentive. Last ride of the day was RM6.23. So the entire day, I spent slightly over RM 20, which was really cheap for the comfortable and time saving. My last trip on Penang was to the airport with Johnny. He drives a CRV which I’m very happy with because I had a huge luggage. I was worried the smaller cars might not have boot space for the luggage. So again I had a good chat with the driver. It was more like a friend driving me rather than a driver. Most of them are part timers. They take up jobs when they have free time. 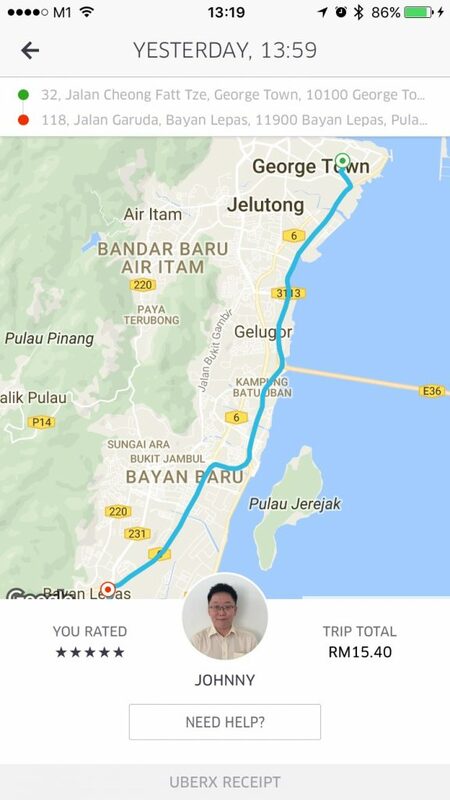 Because it’s so affordable, locals use Uber even for short distances with fares as low as RM 2. Very important tip. If you take UberX from the airport on arrival, go to the departure level instead. The local cab drivers are hostile when Uber drivers pick up from the arrival level. As for me, I’m happy with the efficiency and lower cost. So when I came back to Singapore, I used Uber as well from the airport. No more attitude and sulky face from cab drivers when learning that my destination is Tampines. 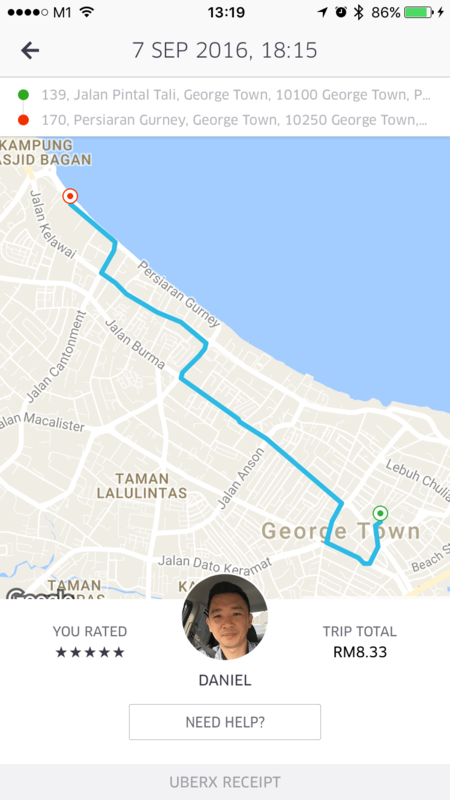 Uber drivers are perfectly ok with short distances. Looks like Uber’s the way to go for me going forward.